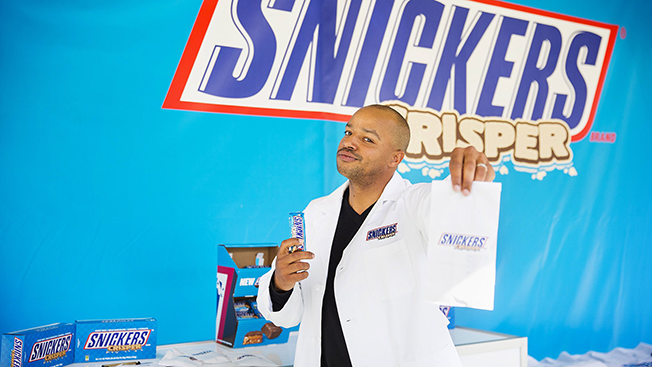 Snickers is prescribing "cures" for hunger with the help of one of the most famous TV doctors of the early 2000s, Scrubs star Donald Faison. Faison appeared at Snickers' "Crisper Clinic," a pop-up event at The Grove in L.A. on Tuesday, to support the launch of the new Snickers Crisper candy bar. Visitors could provide selfies for a "hunger diagnosis" by Faison, who "treated" each of them with a free Snickers Crisper. "I've been taking selfies all morning and kissing babies—I should be a politician," Faison told Adweek. "People really seemed to enjoy it. Some people were like, 'Holy cow! It's the guy from Scrubs!' and some people had no idea who I am, which is cool too." A number of fans also recognized Faison from the '90s classic, Clueless, he said. The Crisper campaign includes ads by BBDO with scenarios in which people act foolishly because they're hungry. This year's "You're Not You" spots for the Snickers flagship brand, which ran during the Super Bowl, featured Willem Dafoe and Eugene Levy. "Celebrities are a staple of our campaigns because they're well known enough to help represent an out-of-sorts behavior and help us personify the funnier side effects of hunger," said Snickers' brand director Allison Miazga-Bedrick. "Since Donald is perhaps best known for playing a doctor on TV, he was a natural fit to help us 'diagnose' fans' hunger problems." Added Faison, "It's fun to play a role, being out here 'prescribing' Snickers Crispers to people. I've been a fan of Snickers since I was a kid. Halloween was always an opportunity for me to binge on them."